He stood on the sidelines as a redshirt freshman, and unlike many other first-year players, he had experienced a magical season. First it was one win, then it was another, and as the weeks and months progressed, his team kept on winning. The magical ride that he was on was memorable, not only for himself and his teammates, but for the thousands of fans that cheered them on each and every Saturday, as well. That magical season was four years ago, and as Hroniss Grasu stood on the sidelines for 2011 BCS National Championship game between the Oregon Ducks and the Auburn Tigers, he dreamed about the day that he would make an impact in a game of that magnitude. If you’re a rabid Oregon fan, or if you just love college football, I don’t think I need to tell you how the 2011 national championship game ended. Most Duck fans still remember that painful three-point loss, but nobody remembers that day more clearly than Grasu, even if he watched the entire game from the sidelines. “I was a little young buck; I was tiny; I couldn’t play,” he said when asked about the 2011 championship game. What Grasu remembers vividly about his experience, however, wasn’t the actual game, or the presents that players receive when they participate in a bowl game, but it was the week in practice that led up to that game that he remembers the most. The Ducks’ redshirt senior said that the team had a great week of practice before they played Auburn, and he also mentioned: “It was the best preparation leading up to a game that we had all season long.” But what happened? 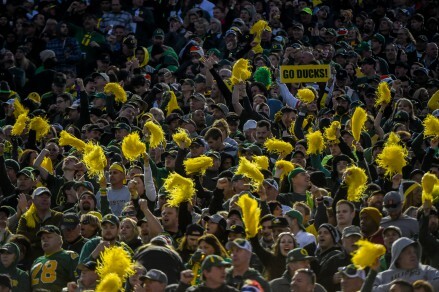 Oregon fans are excited and ready to cheer on their beloved Ducks, as they prepare for the national championship game. While Oregon’s Heisman winner Marcus Mariota has garnered much of the attention the last few years, and has been credited as the MVP and the leader of the Ducks’ fast-paced attack, a compelling argument about Grasu’s importance to the team can be made as well. 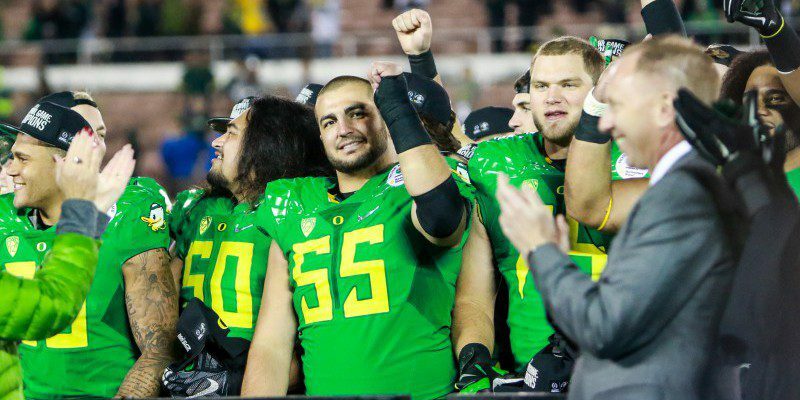 Not only has Oregon’s center played a key roll in the locker room and on the practice field, but he’s also led by example. The Ducks’ All-American center has played in 51 out of a possible 54 career games, and before suffering a leg injury in early November, causing him to miss Oregon’s next three games, including the Pac-12 Championship game against Arizona, he had appeared in 50 straight games. Whether it’s a regular season game, or just another day in practice, one thing is clear: you can always count on Grasu. The Ducks’ last appearance in the national championship game left a bad taste in their mouth, but Oregon’s redshirt senior is thankful for the opportunity to be back on the big stage. This time will be different, however, instead of standing on the sidelines like he did four years ago, Grasu will be helping his team on the field.